SharePoint 2019, 2016, 2013, and 2010 Workflow Activities Extensions is a no-code set of 270+ SharePoint activities for creating custom SharePoint Workflows using SharePoint Workflow Designer. SharePoint 2019, 2016, 2013 and 2010 Workflow Activities Extensions is a no-code set of 270+ SharePoint activities for creating custom SharePoint Workflow using SharePoint Workflow Designer. SharePoint Workflow Activities Extensions Kit can be used for Microsoft SharePoint 2016, 2013, 2010 and includes extended custom activities for sending e-mail and sms, dealing with Active Directory, managing SharePoint sites, and many more activities for creating custom SharePoint 2010, 2013, 2016 and 2019 workflows. It is a part of Virto SharePoint Workflow Suite and Virto ONE License. Use a wide range of SharePoint Workflow Activities to automate any business process quickly and easily. 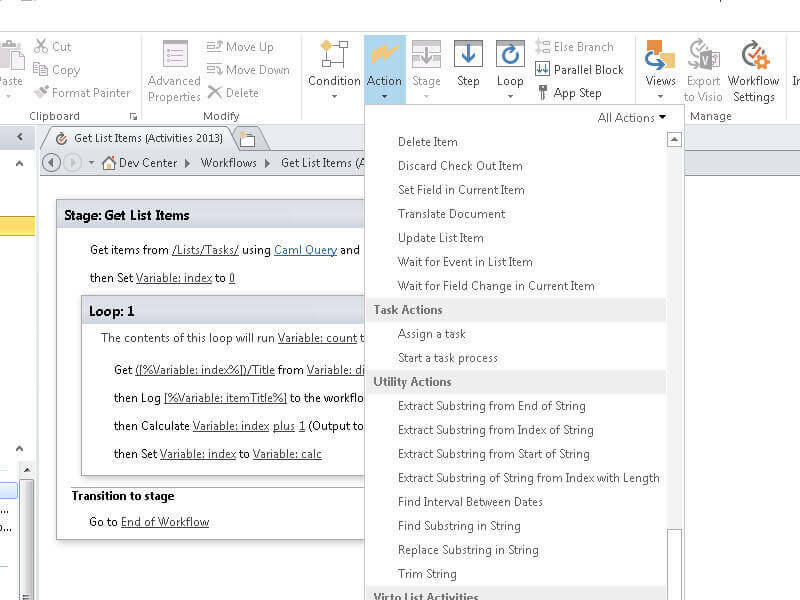 Increase the processes efficiency in your company, using custom activities set. No additional extra skills are needed other than the familiar SharePoint Designer demands. Now, you will have more time to focus on what matter. Every SharePoint 2010 workflow continues to work as they did previously if you upgrade to SharePoint 2013. SharePoint Workflow Activities Extensions Kit supports backward compatibility, so the migration from an older version of SharePoint is not an issue! If you need a specific SharePoint activity, and you did not find it in the Virto SharePoint Workflow Activities Extensions set, you can send your request and we will fulfill it within 3 Business Days. How Virto SharePoint Workflows work? VirtoSoftware expands the range of SharePoint workflow activities with custom workflow activities set for SharePoint Designer. With SharePoint Workflow 2016, 2013, and 2010 Activities Extensions Kit by VirtoSoftware, you can build your own custom workflow within a minute! Virto SharePoint Workflow activities kit is a set of ready-to-use actions. You don’t need any other tools than SharePoint Designer to work with Virto actions. - The Virto Workflows kit should be downloaded and installed in your SharePoint environment. - Then you just activate Virto Workflows as a feature in your SharePoint. - Open SharePoint Designer and connect it to your site with activated Virto SharePoint workflows feature. - You will see all Virto workflows in SharePoint Designer in the same dropdown list of default workflows available on your site. - Create your own workflow, using Virto actions as steps. You may combine it and build any complex workflows. 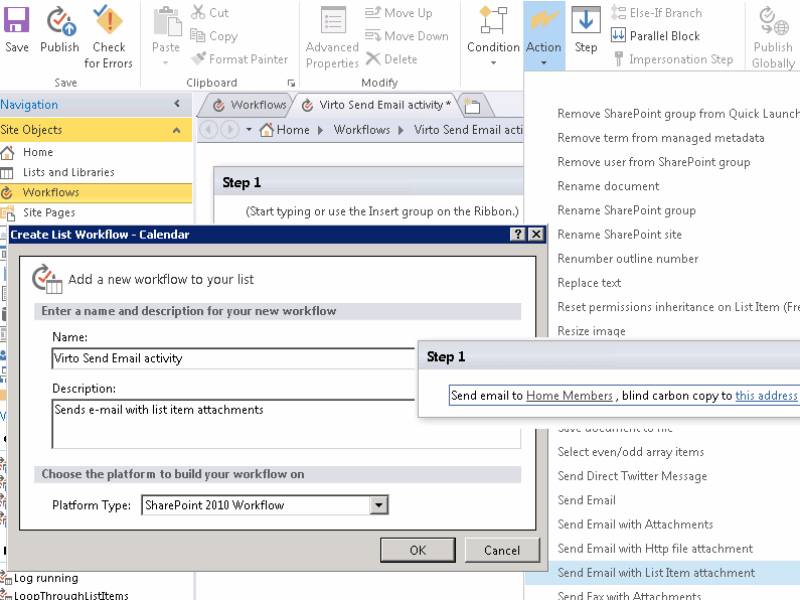 Then publish it, as you usually do for SharePoint workflows created with default actions. - You can run the new workflow in your SharePoint on a site or for an item, as you usually start any other created workflows. No any other customization steps are required. You may use Virto SharePoint workflow activities as you use default actions and start building your own custom workflows. They appear in your SharePoint Designer and are ready-to-use on your site! There are available activities for SharePoint 2010 workflow and 2013 workflow platoform. You may use workflows from 2013 platform as SharePoint 2016 workflow actions. There are many SharePoint workflow examples to automate your business processes. Virto SharePoint Custom Workflows Activities Kit includes extended activities for sending e-mails, sms, creating folders and AD users, converting date & time, and much more! If you have a business process that isn’t covered with default workflows in SharePoint, you may extend your SharePoint Designer actions with 270+ Virto workflows. They work the same way! You don’t need special skills and additional education to use them for building new workflows. Install over 270 custom workflow activities for SharePoint or request your own custom activity. If the current set of Virto workflows doesn’t contain a SharePoint 2010, 2013, or SharePoint 2016 workflow you required, you could send us a request and we create new actions to match your SharePoint processes automation needs. -Stop inhereting permissions on list item/on list/on site. -Restore inhereting permissions on list item/on list/on site. -Add user to SharePoint group. -Check if user is a member of SharePoint group. -Get members of SharePoint group. -Grant Permission on list item/on list/on site. -Remove all list item permissions/all list permissions/all site permissions. Task Activities (3) With WAK you can design workflows for creating tasks including summary ones and calculating due. PDF Activities (1) Supported converting Word document to PDF. -Convert Word document to PDF. Default Column Values Activities (4) Supported setting field default value for folder, getting field default value for folder, removing field default value from folder and removing all default values from folder. -Remove all default values from folder. -Get assignable value from taxonomy field. File Activities (3) Supported creating and deleting directory and file deleting. Array List Activities (14) Some activities support Array List but SharePoint Designer doesn’t allow to create, edit or update array. Use WAK to create, edit and update array. Database Activities (1) You can execute SQL script with workflow initiated with WAK. Date Time Activities (5) With WAK you can run workflows for date and time, such as setting constant date, converting date from local time to UTC and UTC to local time, date to text. Code Activities (1) Supported Execute custom code activity allows executing a custom C# or VB.NET code from SharePoint Designer Workflows. SharePoint Site Management Activities (25) Manage your SharePoint site: create or delete SharePoint site or site collection, create, delete and rename SP groups, add and remove users to SP groups, create SP lists and documents, update site title and description and many others. -Update site title and description. Finance Activities (1) Currency Converter is supported. Workflow Activities (5) Workflows for workflows are also can be used. E.g. start another workflow or workflow extended, terminate workflows including running ones. User Activities (3) Use lookup site user property, lookup initiator user property and set site user property for managing users in SharePoint. -Set Site User Property (Free). List Activities (33) Organize workflows for working with SharePoint lists: activities with list items and list fields, calculating functions, generating reports, uploading attachments, get version history and many others are supported. -Get list item url extended. -Set InfoPath form field inner xml (Free). Permissions Activities (12) Adjust workflows for managing SharePoint site permissions, such as site and list permissions inheritance, grant permission on site, custom permissions and etc. -Grant permission on List Item extended. Active Directory Activities (21) Almost any information stored in Active Directory can be used for workflows in the component (email, department, job title, custom attribute and etc. can be get in workflows). You can also add and delete new members, define passwords, enable and disable users’ accounts and etc. -Disable user account in Active Directory. Http Activities (3) Supported Web Request, Receive Html, Send Http Post activities. Text Activities (18) Wide range of activities for working with text are available for SP users: capture text, capture all occurrences of text, replace or validate text, translate text (Powered by Google translator and Microsoft translator), trim, substring, split text and etc. -Convert text to upper, lower, title case. Email Activities (7) Supported sending Emails (including emails with a List Item Attachment, Http File Attachment, Attachments Forward Email), setting Smtp server settings and receiving Email activities. XMPP (Jabber, GTalk) Activities (1) Create Workflows for sending Xmpp (Jabber, GTalk) Instant messages. -Send Xmpp (Jabber, GTalk) Instant message. Twitter Activities (3) Using WAK you can set Twitter OAuth authentication and certainly send Twitter Messages including direct ones. Sms Activities (4) Send SMS via Microsoft Office Mobile Service Protocol, SMPP server or Clickatell. You can use Bulk SMS Gateway or SmsCountry Bulk SMS Gateway. -Send SMS via SmsCountry Bulk SMS Gateway. Impersonation Activities (1) This group of activities allows running activities from custom user account (not System Account) in Current Step Set. On a very quick look it appears excellent and extremely easy to use. The pack contains all SharePoint workflow activities we needed. Perhaps too costly for something that can be done for free with several other tools. It solved the purpose for which I purchased it. Easy, safe, & worth every dollar! Great kit of SharePoint workflow activities! Our company already purchased it, and we just tried free SharePoint 2013 workflows in major update. Thanks again, keep up the good work. Virto Sharepoint Custom Workflow is indispensable tool that helps me automate all aspects of SharePoint, from user activation to document publishing. I can’t think of working without it!